The inscription on the ball is B.I.R. 1912-13 but we don't know what B.I.R. stands for. I've no evidence for this, but my best guess is that the I.R. stands for Injury Reserve(s). Brilliant and thanks for the help everyone. My Dad recognised Albert Hayley and a couple of others who possibly moved to Westridge when they left the Whitley. Here's another one for you to have a look at. We think it's possibly a Bedlington Station YMCA team. The player at the front left is called Watson. I went to school with his daughter Ann. By God-this causes a right owld head scratch kidda!! Middle man, back row (blonde quiff) is Billy Davison/Davidson. Year or two older than Ageds and living it Stakeford! His father showed my father "the ropes" at the pit! His sister married a bloke called Long who lived at Cambois-I went to school wi their daughter! Lives around where I live apparently! The feeling is that a lot of them were grammar school boys. Dad thinks the only place he can recall at the mo with an arch would be Cornwall Creacent-this is adjacent to the football field. Pop Clouston n Edie Graham lived on that street apparently! That will be another story which will unravel at some point I'm sure!! The dates don't match on my way of thinking, here, but could the BIR stand for Bedlington Ironworks Reserves??? I Think most houses in Haig Rd., Beatty Rd. and Cornwall Crescent had arches. It was a modernity of the time to bring the outdoor toilet 'indoors'. I'd thought of that, but as you say it's historically unlikely. Injury Reserve seems to be a reasonably common soccer term if you try a bit of searching. I drew a blank as to what the 'B' might be for though. Interests:Guitars,Motorcycles,Remembering my wee Labrador cross...Little Black Jess..deceased 19-2-19 R.I.P LBJ.Sadly missed. 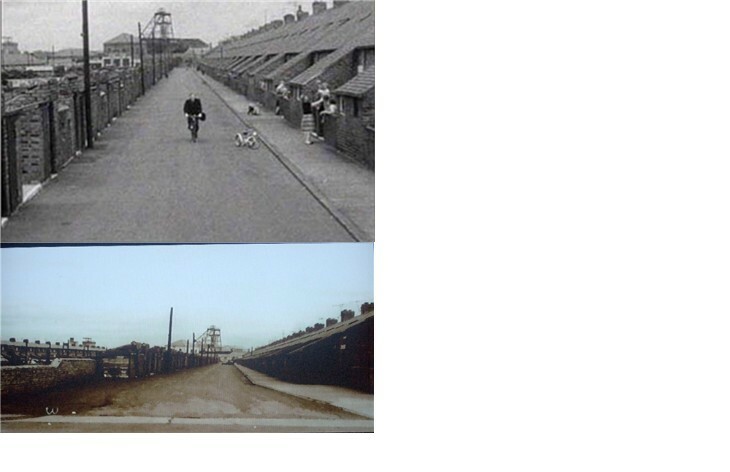 Just to clear up the ambiguity of the houses....the set up on the right of the pic,over from the Whitley School IS Hollymount Square,where i lived from it first being built after the war,left a bit,and you can see Haig Road,and Cornwall Crescent,facing onto the Dr pit football field. Central,and leading over to Haig Road,is Rosalind Avenue ,aa knew every body in them houses when i lived there,but a lot of names are gone noo! Alan was considered for East Northumberland juniors football team,but a canna mind noo,if he got there,but he was a great footballer,even though I knew nowt aboot fitba',I could see how good he was back then! Derek Wilkinson,is the spitting image of Alan,and in 1953 we were eight/nine years old,depending which part of the year you look at. So,while Derek was captain here,Alan was following close on his older Brother's heels. The likeness is really freaky..it's like I'm looking at a pic of Alan!! It's also freaky how they both suffered death-defying terrible accidents,at about this time of life,and survived to tell the tale! Derek,fell from the old Humford mill building,which stood at the top of Bedlington Bank,while trying to reach a pidgeon's nest,injuring his head very badly. Alan fell of the spiky low railings which went around the gardens at the market-place,next to the market cross,as he was trying to walk along the top of the spikes. One of the spikes went through him,and impaled him,near to his heart. Doctors said he was very lucky to be alive. Alan,if you are in there,can you confirm the stories for me please?! Is that not Joe Raisbeck[bus driver-Raisbecks buses]? sure looks like him,hair an' all!,who is captain? Thanks for the help so far. Dad agrees that the YMCA picture was taken near Haig Road/Cornwall Crescent and is trying to contact someone in the picture to confirm this and to obtain a date (for the photo not for Valentines Day!!). He can't come up with a name for the B.I.R. team but the suggestions were excellent. One thing he did say about the photograph was that the lad sitting on the front right was called Hardy. Scouts came up to watch his brother play but ended up signing him instead and he went on to play professionally for either Cardiff or Swansea. 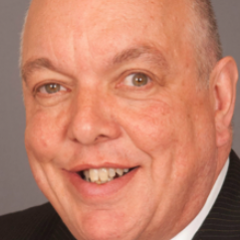 Reedy - just spotted my mistake. I copied the wrong photo to my last post on this subject. The ramblings of my relative were about the possible YMCA photo. Front Row L-R, Ken Watson, Dobson (lived in Pioneer Tce), Joe Austin/Raisbeck, Dobson, Young. Thank you sir. 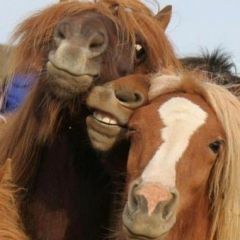 I have passed the update on to see if that helps stimulate the ageds! Great website. Certainly helping to stimulate Dads memories. I'll be posting more 'help needed' photos soon. Thanks to everyone. Reedy - just like to pinch your topic, to identify a street for me. 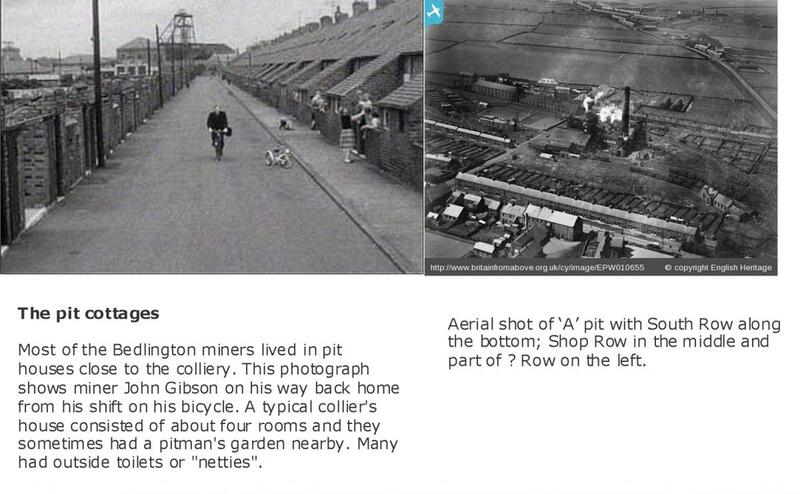 Whilst searching for other stuff landed on http://www.bbc.co.uk/insideout/northeast/series7/ (that appears to be an old or redundant site) this story about John Gibson, Bedlington Miner, and shows him riding his bike in one of the pit rows. Can anyone identify the row he is riding in? In my mind South Row was like the one in the picture with John Gibson riding his bike - each house with a small yard at the back. I can only remember the 'A' pit rows having the back yard. The Dr Pit rows had the back door straight onto the path. BUT this picture shows the pit head at the end of the street and therefore could not be South or Shop row. There is a row of houses in the aerial shot that I can't remember being there when I used to cross through the 'A' pit to Barrington School and a photo from that row would show the pit head. Oooops -ignore that request. I found the picture via flickr.com/photos and every time I attempted to go to the site address to view the full set of pictures I got page not available. I have now found the original insideout posting and John Gibson did take part in the Bedlington Miners Picnic, but not for any pit in Bedlington, he was part of the Pegswood miners band. So I assume that street, that looks like South Row to me (apart from how tidy it is! ), is a Pegswood pit row. Dad is certain it's Shiney Row with the Dr Pit at the far end. 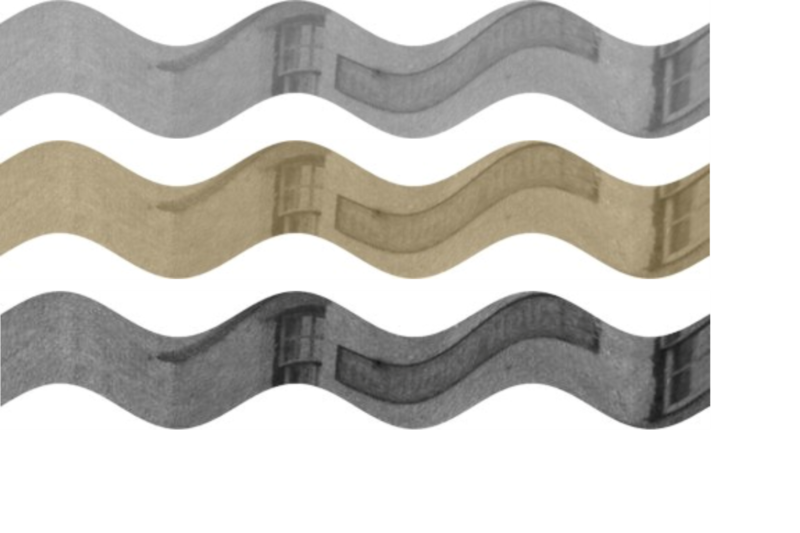 there is an entry by threege Posted 07 February 2010 - 02:31 AM that has a photo of Shiney Row from a very similar angle to the one I found. 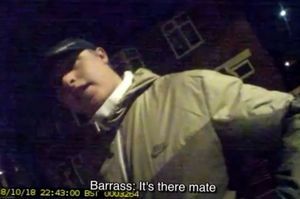 I think this guy used to cycle from Pegswood to Bedlington each day. The film Ken Russell made in the 60s features him and then he is in the follow up film that was made in the oo's. If I am correct, he was in a brass band, and talks to Ken Russell in the bottom club. Your right Maggie, it is one of the photos from the Ken Russell article on the Miners Picnic that he did in 1960 and followed it up, came back to Bedlington, in 2005. It might just be my 51 and three quarters year old dodgy eyesight but can anyone name the pub. The sign looks like it ends with 'House'. Well my even older dodgier eyesight also failed. Using Microsoft Digital Image I applied every filter and distortion I could. The best, for my eyes, I got was by cutting out the sign and distorting the image. Definiteley say the last word is house but the; it appears to start with 'JO' then the rest beats me. I tried the same, Eggy, but I got something like Josshinse House!!! Or Tosshinge House. But I tell you where it looks like, assuming its quite local, - The Bebside Inn. I agree it's similar to the Bebside Inn but the Inn has 3 upstairs windows. It might not even be a pub. Looks like a really old photo and I'm not sure the women featured would have gone into rough public houses in those days. 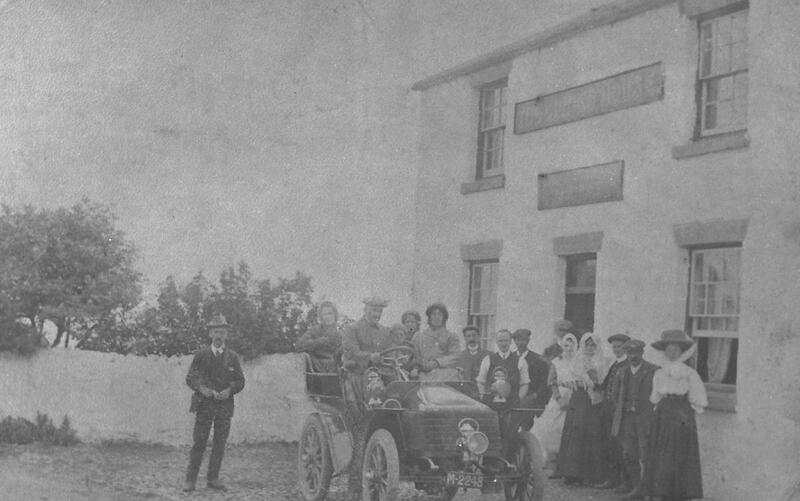 The photo is one of only 4 unidentified pictures in Dad's collection so is probably a Bedlingtonshire building. Not saying cars didn't move around the country in the early 19 hundreds, but the 1 or 2 letter plates followed by 4 numbers were issued between 1903 & and the mid 1930s. The registration M-2248 on the old car is, according to the 'Chiltern Vehicle Preservation Group' that have issued a document http://www.cvpg.co.uk/REG.pdf detailing when and where car registrations were issued, gives that car as registered in Chichester in 1919. Must get out for a pint!